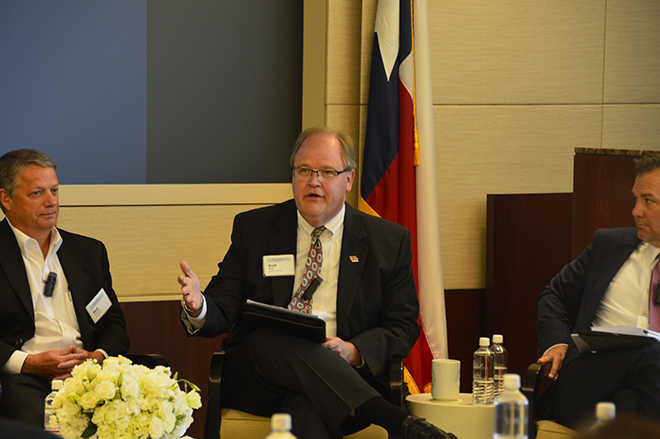 University of Houston Law Center Professor Bret Wells shares his thoughts on tax reform at a panel discussion Wednesday at Vinson & Elkins in Houston. June 23, 2017 – University of Houston Law Center Professor Bret Wells opined that tax reform will likely be restricted to businesses and that comprehensive individual reform is unlikely. He made these comments at a continuing legal education session titled, "Tax Reform: Perspectives From Across the Nation - Impact on the Energy Sector." The event was hosted by the American Bar Foundation and Tax Analysts at Vinson & Eklins' office in downtown Houston. The talk was also broadcast to Vinson & Elkins' offices in Austin, Dallas, New York and Washington D.C.
"There is just too much acrimony in Washington," Wells said. "In this caustic political environment, the only consensus that can be achieved is for business tax reform. I don't think there is any political will to use individual tax revenue-raisers to offset the revenue loss that results from lowering the corporate tax rate. "Practical constraints limit what can be achieved politically. I think that anti-earning stripping base protection measures, like a base protecting surtax, represent the type of revenue offsets that are essential for business tax reform that seeks to provide a reduction in corporate tax rates." Wells pointed to the Tax Reform Act of 1986, when there was bipartisan support to reach comprehensive legislation. He reiterated that the current political climate would make similar legislation in 2017 doubtful. "We all idealize the 1986 Act and the significant tax reform that happened then," he said. "That is not the current environment. Based on the current environment, it is likely that tax reform will be done on a party-line vote, and the only area where tax reform seems to have sufficient galvanized support is business tax reform, in my view." Wells has been vocal about the topic of tax reform previously, testifying before the U.S. Senate Committee on Finance in May of 2016. Additional panelists included Mark Humphrey, senior vice president of Koch Industries, Greg Matlock, partner at Ernst & Young and David Peck and Christine Vaughn, tax partners at Vinson & Elkins. The discussion was moderated by Chris Bergin, president and publisher of Tax Analysts.